Shop till you drop at Village Gallery and Underart Gallery. Take a break from the city and head to Scuba & Snorkeling and Trinity Beach. Step out of Cairns with an excursion to Palm Cove Beach in Palm Cove--about 32 minutes away. And it doesn't end there: tour the pleasant surroundings at Esplanade Boardwalk, don't miss a visit to Freshwater Station, browse the eclectic array of goods at Rusty's Market, and browse the different shops at Stockland Cairns Shopping Centre. For traveler tips, where to stay, maps, and other tourist information, read our Cairns trip planning website . Kuwait City, Kuwait to Cairns is an approximately 21.5-hour flight. The time zone difference moving from Arabia Standard Time (AST) to Australian Eastern Standard Time (Queensland) (AEST) is 7 hours. Traveling from Kuwait City in October, you will find days in Cairns are slightly colder (34°C), and nights are about the same (24°C). Cap off your sightseeing on the 11th (Fri) early enough to catcht the bus to Cape Tribulation. You'll enjoy a bit of beach vacationing at Thornton Beach and Myall Beach. Visiting Daintree Rainforest - Cooper Creek Wilderness and Daintree National Park will get you outdoors. Go for a jaunt from Cape Tribulation to Daintree to see Floravilla Ice Cream Factory about 44 minutes away. The adventure continues: stroll through Dubuji Boardwalk. Plan a trip to Cape Tribulation easily and quickly by telling Inspirock to suggest an itinerary. Getting from Cairns to Cape Tribulation by bus takes about 3.5 hours. Other options: drive. Expect a daytime high around 34°C in October, and nighttime lows around 23°C. Wrap up your sightseeing on the 14th (Mon) to allow time to travel to Port Douglas. Step out of the city life by going to Safaris and Scuba & Snorkeling. 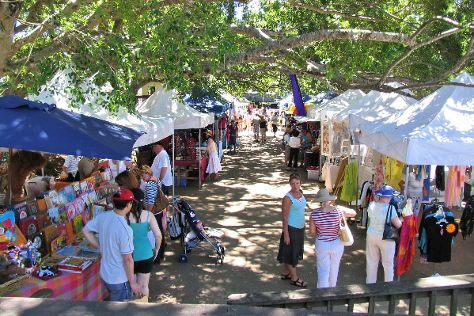 Head to Sunday Market Port Douglas and Des Spencer Galleriesfor some retail therapy. Next up on the itinerary: enjoy the sand and surf at Four Mile Beach, identify plant and animal life at Mossman Gorge, explore and take pictures at Hartley's Crocodile Adventures, and look for gifts at With Sugar. To find ratings, traveler tips, and more tourist information, go to the Port Douglas trip itinerary planner . You can do a combination of car and ferry from Cape Tribulation to Port Douglas in 2 hours. Alternatively, you can take a bus. In October, daytime highs in Port Douglas are 34°C, while nighttime lows are 23°C. Wrap up your sightseeing on the 18th (Fri) early enough to travel to Airlie Beach. Give yourself a bit of retail therapy at Into The Blue Gallery and Art Whitsunday Gallery & Shop. Get outdoors at Scuba & Snorkeling and Airlie Beach Lagoon. On the 20th (Sun), spend a thrilling day on the water with a speed boat tour. Next up on the itinerary: zoom along the surf with a waterskiing or jet-skiing adventure. To see where to stay, ratings, maps, and tourist information, go to the Airlie Beach online vacation planner . Traveling by combination of shuttle, flight, and ferry from Port Douglas to Airlie Beach takes 6 hours. Alternatively, you can do a combination of shuttle, flight, and bus; or drive. When traveling from Port Douglas in October, plan for slightly colder days in Airlie Beach, with highs around 30°C, while nights are about the same with lows around 24°C. Cap off your sightseeing on the 21st (Mon) early enough to travel to Noosa. Give yourself a bit of retail therapy at The Original Eumundi Markets and Kawana Shoppingworld. Change things up with these side-trips from Noosa: Maroochydore, Sunshine Plaza (in Maroochydore) and Artworks in Clay by Anne Gentry-Smith (in Montville). There's much more to do: look for gifts at The Real McCaul, take a stroll through Hastings Street, explore the galleries of Artisans Gallery, and take in the exciting artwork at Noosa Regional gallery. To see reviews, maps, photos, and other tourist information, refer to the Noosa itinerary website . Do a combination of bus and flight from Airlie Beach to Noosa in 10 hours. Alternatively, you can drive; or do a combination of bus and train. 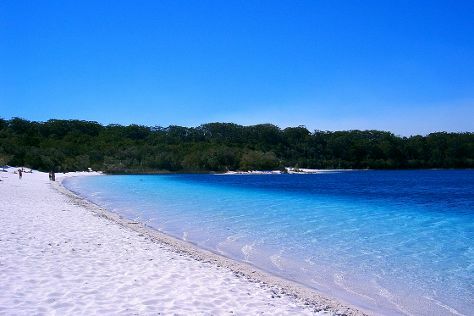 Finish your sightseeing early on the 24th (Thu) so you can travel to Fraser Island. Get in touch with nature at Seventy-Five Mile Beach and Eli Creek. To find traveler tips, photos, reviews, and other tourist information, refer to the Fraser Island visit planner . Traveling by combination of car and ferry from Noosa to Fraser Island takes 7 hours. Alternatively, you can do a combination of train, car, and ferry; or do a combination of bus, car, and ferry. Expect a daytime high around 31°C in October, and nighttime lows around 19°C. Wrap up your sightseeing on the 27th (Sun) early enough to travel to Gold Coast. Give yourself a bit of retail therapy at Pacific Fair Shopping Centre and Robina Town Shopping Centre. You'll enjoy a bit of beach vacationing at Surfer's Paradise Beach and Burleigh Head National Park. Step out of Gold Coast with an excursion to Lone Pine Koala Sanctuary in Brisbane--about 1h 30 min away. There's still lots to do: stroll through Burleigh Heads Beach, revel in the low prices at Harbour Town Outlet Shopping Centre, view the masterpieces at Boomerang Art - Aboriginal Art Gallery, and explore the world behind art at 19 Karen Contemporary Artspace. Plan my Gold Coast trip by asking Inpirock to come up with tips and suggestions. Getting from Fraser Island to Gold Coast by combination of car and ferry takes about 8.5 hours. Other options: do a combination of car, ferry, and train; or do a combination of car, ferry, and bus. October in Gold Coast sees daily highs of 29°C and lows of 18°C at night. Wrap up your sightseeing on the 30th (Wed) to allow time to travel back home.